Born in Göttingen, Germany, daughter of Thyra A. (née Leisner) and Oskar Hagen, an art historian and musician. Hagen and her family emigrated to the United States in 1924. Though shipping records indicate that he took a position at Cornell University, his new position was in fact at the University of Wisconsin, Madison . Uta was raised in Madison, Wisconsin. She appeared in productions of the University of Wisconsin High School and in summer stock productions of the Wisconsin Players. She studied acting briefly at the Royal Academy of Dramatic Art in 1936. After spending one semester at the University of Wisconsin, where her father was the head of the department of art history, she left for New York City in 1937. Her first professional role was as Ophelia opposite Eva Le Gallienne in the title role of Hamlet in Dennis, Massachusetts in 1936. Hagen was an influential acting teacher who taught, among others, Matthew Broderick, Christine Lahti, Amanda Peet, Jason Robards, Sigourney Weaver, Katie Finneran, Liza Minnelli, Whoopi Goldberg, Jack Lemmon, Charles Nelson Reilly, Manu Tupou, Debbie Allen, Herschel Savage, George Segal, Jon Stewart, and Al Pacino. She was a voice coach to Judy Garland, teaching a German accent, for the picture Judgment at Nuremberg. Garland's performance earned her an Academy Award nomination. Gene Wilder, Robert DeNiro, Daniel DeWeldon, Tony Goldwyn, Faye Dunaway, Laura Esterman, Carol Rosenfeld, Hal Holbrook, Hal Holden, Sandy Dennis, Griffin Dunne, Jeffrey Essmann, Delaney Hibbits, Daniel Gnad, Barbara Feldon, Tovah Feldshuh, Katie Finneran, Constance Ford, Victor Garber, Rita Gardner, Charles Nelson Reilly, Lee Grant, Charles Grodin, Eileen Heckart, Deborah Hedwall, William Hickey, Gerald Hiken, Anne Jackson, Harvey Korman, Geraldine Page, Jason Robards, Jr., Matthew Broderick, Corey Parker, Whoopi Goldberg, Amanda Peet, Jack Lemmon, Ted Brunetti, Lindsay Crouse, Fritz Weaver, Kevin Sussman, Rochelle Oliver and Rene Napoli. Uta Hagen was married to José Ferrer from 1938 until 1948. They had one child together, their daughter Leticia (born October 15, 1940). They divorced partly because of Hagen's long-concealed affair with Paul Robeson, her co-star in Othello. Hagen married Herbert Berghof on January 25, 1957, a union that lasted until his death in 1990. Hagen died in her Greenwich Village in 2004 after suffering a stroke in 2001. 1951 Tony Award, Actress—Play, The Country Girl"
1963 Tony Award, Actress—Play, Who's Afraid of Virginia Woolf? "Once in a while, there's stuff that makes me say, 'That's what theatre's about'. It has to be a human event on the stage, and that doesn't happen very often." ^ Hagen, Uta (1973) . Respect for Acting. New York: Wiley Publishing, Inc. ISBN 978-0-02547-390-4. ^ "Elected to the Theater Hall of Fame". The New York Times. March 3, 1981. Retrieved November 14, 2013. ^ a b c d e f "Uta Hagen, 84; Tony Winner, Teacher at Famed Acting School". The Los Angeles Times. January 16, 2004. p. 164. Retrieved March 7, 2019 – via Newspapers.com. ^ Current Biography Yearbook. H. W. Wilson Company. 1964. Retrieved November 14, 2013 – via Google Books. ^ Port of New York, passenger list of the S.S. Luetzow, September 4, 1924, sheet 41. ^ "Dr. Oskar Hagen to talk on art". Cornell Daily Sun. March 21, 1930. Retrieved 4 April 2019. ^ Port of New York, passenger list of the S.S. Westernland, December 24, 1936, sheet 165. ^ Miles, S. A. (Fall 2000). "Lady Invincible". Wisconsin Academy Review. 46 (4): 19–23. Retrieved 28 February 2019. ^ a b Buckley, Michael (18 January 2004). "Stage To Screens: A Chat with Theresa Rebeck; Remembering Uta Hagen". Playbill. Archived from the original on 20 October 2012. Retrieved 30 March 2011. ^ a b Gussow, Mel (15 January 2004). "Uta Hagen, Tony-Winning Broadway Star and Teacher of Actors, Dies at 84". The New York Times. ^ "Uta Hagen's Acting Class". IMDb. 2001. Retrieved 28 February 2019. ^ "Workshops". Colorado School of Acting. Archived from the original on 1 September 2015. Retrieved 8 November 2015. ^ a b "Harvey Korman". Archive of American Television. 20 April 2004. Retrieved 18 June 2012. ^ Oxman, Steven (10 June 2001). "Review: 'Six Dance Lessons in Six Weeks'". Variety. Retrieved 29 September 2016. ^ "Uta Hagen Memorial". The New York Times. 20 March 2004. Retrieved 18 June 2012. ^ Migdal, Sylvan (27 January 2004). "Uta Hagen, legendary actor and teacher, dies at 84". The Villager. Retrieved 28 February 2019. ^ "Home". Ted Brunetti Studio. Retrieved 28 February 2019. ^ "Uta Thyra Hagen Facts". YourDictionary.com. Retrieved 28 February 2019. ^ "1951 Tony Awards". Infoplease.com. Retrieved 14 November 2013. ^ "Meet Uta Hagen". HB Studio. Archived from the original on 11 July 2010. Retrieved 28 February 2019. ^ Book of Members, 1780–2010: Chapter H (PDF). American Academy of Arts and Sciences. Retrieved July 25, 2014. ^ "Uta Hagen Quotes". BrainyQuote. Retrieved 14 November 2013. Wikimedia Commons has media related to Uta Hagen. Alfred Davis Lunt, Jr. was an American stage director and actor who had a long-time professional partnership with his wife, actress Lynn Fontanne. Broadway's Lunt-Fontanne Theatre was named for them. Lunt was one of 20th century Broadway's leading male stars. Geraldine Sue Page was an American actress. She earned acclaim for her work on Broadway as well as in major Hollywood films and television productions, garnering an Academy Award, two Primetime Emmy Awards, two Golden Globes, one BAFTA Award, and four nominations for the Tony Award. Lois Maureen Stapleton was an American actress in film, theater and television. She was nominated for the Academy Award for Best Supporting Actress for Lonelyhearts (1958), Airport (1970) and Interiors (1978), before winning for her performance as Emma Goldman in Reds (1981). She was inducted into the American Theatre Hall of Fame in 1981. Stella Adler was an American actress and acting teacher. She founded the Stella Adler Studio of Acting in New York City in 1949. Later in life she taught part time in Los Angeles, with the assistance of protégée, actress Joanne Linville, who continues to teach Adler's technique. Her grandson Tom Oppenheim now runs the school in New York City, which has produced alumni such as Marlon Brando, Robert De Niro, Harvey Keitel, Elaine Stritch, Kate Mulgrew, Kipp Hamilton, and Jenny Lumet. Beatrice Whitney Straight was an American theatre, film and television actress and a member of the prominent Whitney family. She was an Academy Award and Tony Award winner as well as an Emmy Award nominee. Blanche DuBois is a fictional character in Tennessee Williams' 1947 Pulitzer Prize-winning play A Streetcar Named Desire. The character was written for Tallulah Bankhead. L. Scott Caldwell is an American actress known for her role as Rose on Lost. Jack Garfein is a key historical figure of the Actors' Studio, director, writer, teacher and producer. Haila Stoddard was an American actress, producer, writer and director. 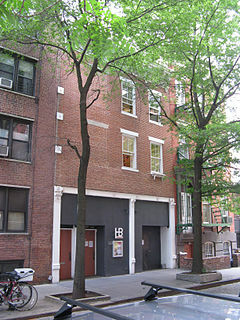 The HB Studio is a non-profit 501(c)(3) organization offering professional training in the performing arts through classes, workshops, free lectures, theater productions, theater rentals, a theater artist residency program, as well as full-time study through their International Student Program and Uta Hagen Institute. Herbert Berghof was an American actor, director and acting teacher.